Years ago traveling preachers would go from town to town, pitch a large tent, preach the gospel nightly for about a week, then move on. People would come from miles around to hear God’s word expounded. In larger cities, such as St. Louis where I grew up in the early 60s, they would set up on a vacant lot near a hub of activity. Whenever I hear Neil Diamond’s song Brother Love’s Traveling Salvation Show, childhood memories of mom hauling us to these revival meetings come to mind. My dad believed in God but wasn’t what you would call a church-going man in those days, so he only came with us once. Unfortunately, there had been a bad storm the night before, resulting in some tent damage. As we nestled into the back row, the enthusiastic preacher was blaming this mishap on Satan and soon had everyone standing, pointing to the holes in the top of the tent, and shouting, “I hate the devil. I hate the devil.” Everyone except my father that is, who slipped our family out quietly and informed us that a preacher who didn’t have the sense to know God is the One who allowed the rain to fall isn’t one he wanted to listen to. Jesus’ parable about the foolish man and wise man building houses in Luke 6:46-49 illustrates this. The foolish man built his house on a shaky foundation and the wise man built on a solid foundation. Then the rains came. It must have been quite a downpour because the foolish man’s house was washed away. The wise man’s house was not. However, it rained on both the foolish and the wise man. Neither escaped the rain. Many Christians feel if they are nice to others and follow biblical principles, they will escape the rain. Oh no, my friend. The thunder will roar and the lightning will strike. It will rain on everyone: the good, the bad, the ugly, the beautiful, the just, the unjust, the atheist, and the Christian. No one escapes the rain. It rained on both the foolish and the wise man. However, each had a different result. The foolish man was wiped out, but the wise man was not. The wise man may have had considerable water damage, but he survived because he built his house on a solid foundation. Spiritually speaking, the house represents our lives and that rock-solid foundation is Jesus Christ. An unshakable foundation can be laid daily by believing Christ, walking with Him, talking with Him, and trusting Him. Those with a shaky foundation cut corners, play the angles, and are self-sufficient. 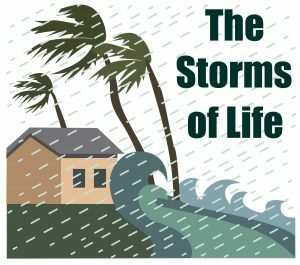 When the storms of life come – and they will come – we rely on whom we have grown accustomed to relying on. Hopefully that will be Christ. Consider this…We are all children at heart, so when the storms of life come it is natural to be anxious or have concerns. 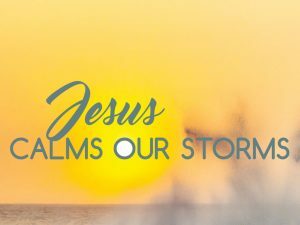 But as the saying goes, “Sometimes God calms the storm; sometimes the storm rages and He calms the child.” Either way, we are far better off trusting God. One final thought… If you want to see the sunshine, you have to weather the storm.